Balancing steady weight loss and permanent changes to food habits is the best way to lose weight and ensure it remains off. Using the food pyramid as a tool to change your eating patterns on a permanent basis is quite simple. Balancing the requisite number of servings from the five food groups makes it easier to manage both reducing your calorie intake and learning to eat more healthily in the long term. A 1600 calorie diet can be maintained for several months, as long as you feel fit and healthy, and can be undertaken without medical supervision, as long as you are in good health and not taking medication for any existing condition. The information below helps you work out the amounts of each food group you can eat and stay within your 1600 calorie limit. It’s important to remember that one way of reducing calorie intake is to choose the lowest fat salt and sugar options in any food group. Look out for the words saturated and trans – these fats are generally bad news because they raise cholesterol and that clogs the arteries and increases the risk of developing heart disease. Both saturated and trans fats are solid at room temperature. Unsaturated fats are liquid at room temperature and do not raise cholesterol levels so it’s good to ensure that as many of your fats as possible come from this group, found in vegetable oils, nuts, and fish. Sugar is rarely labelled that way on food packets – instead you may find any of these terms: sucrose, glucose, fructose, maltose, honey, palm sugar, hydrolysed starch, syrup and invert sugar. While the words may be different, the calorie count will be roughly the same in all cases. Be aware that the higher up the list any fat or sugar appears, the greater the proportion of the total foodstuff it makes up. If a fat or sugar appears in the first three ingredients, and you are on a calorie controlled diet, you may wish to look for a less fattening alternative food. You can eat 140 grams of various grains on a 1600 calorie diet. Each of the following adds up to a 28 gram (old one ounce) portion: 28 grams dry pasta or rice or 1 slice of wholegrain bread, a crumpet or a British flat muffin. A 1600 calorie diet would allow you to eat four servings of vegetables, and a serving in this case is a cupped handful of chopped raw or cooked vegetables, 170 ml of vegetable juice, or two cupped handfuls of salad greens or uncooked spinach. 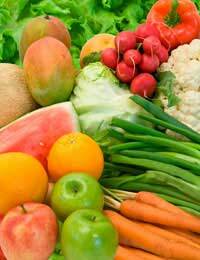 Remember that if you wish to feel full, raw vegetables take longer to eat and feel more filling than cooked ones. Three servings of fruit would be allowed on a 1600 calorie diet and this serving would consist of a cupped handful of chopped raw or cooked fruit, or 170 ml of unsweetened fruit juice. Remember that fruit juice does not contain the fibre and all the nutrients of fresh fruit. Dairy foods can be high in fats and if they are cheeses they may be high in salts while flavoured yoghurts and other milk desserts can be very high in added sugars, so it is important to read food labelling in these cases. Three portions of dairy food are allowed on a 1600 calorie diet and this could be 170ml skimmed milk, 35 grams of cheddar or 50 grams of cottage or cream cheese. Combining your dairy with grains, as in cheese sprinkled over pasta or cream cheese in sandwiches, can be a good way to find the right balance for your food pyramid. It is best to aim at lean meat such as poultry or oily fish, and in either case a 140 gram portion is allowed, this can be made up of eggs (around 50 grams each), or any mixture of cooked beans or tofu, peanut butter or nuts. On a 1600 calorie diet, you should be aiming to consume around 22 grams of ‘good’ fat from your overall diet, not in addition to it, and that fat should come from polyunsaturated and mono-unsaturated fat, such as oily fish, nuts, and vegetable oils. If you can stick to the above guidelines you should have around 130 calories left over at the end of every day to give yourself a treat. Remember that if you have chosen to eat higher fat or sugar containing foods, you may have used up your concessionary calories. Female, 82 years old andhave been on nearly every diet there is.Lose it and gain it.Now 178.65ft. 4 in. Really need to lose this time for medical reasons.Why can't I maintain it?